Three Kettering secondary schools look set to expand and take on more pupils. Plans have been submitted to build a new classroom block at Southfield School in Lewis Road, housing 10 classrooms and a lecture theatre. And extensions are also planned at Kettering Buccleuch Academy in Weekley Glebe Road and Kettering Science Academy in Deeble Road. At girls school Southfield - the county’s highest performing secondary school by Progress 8 in 2017 - admissions are hugely oversubscribed. They increased their intake from 168 to 198 but still the majority of the 454 applications were unsuccessful. 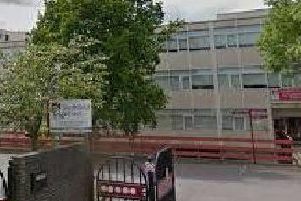 The school has a waiting list of 32 students and plans said the level of intake “is not sustainable within their current premises”. A Southfield School spokesman said: “Southfield School is working collaboratively with the local authority to ensure that there are sufficient secondary school places in the Kettering area in the future. “This year we have already enrolled an additional 30 students in Year 7 to support this ongoing requirement. “Without this joint effort between the school and the local authority there would have been a shortage of Year 7 places in the Kettering area with effect from September 2018. “We are very excited at the prospect of enhancing our existing real estate with an additional build, which will increase our teaching capacity in order to support additional students in the future. The proposed expansion would increase the school’s total capacity from 1,043 in 2017-18 to a projected 1,228 in 2024-25. The new building has been designed to cater for a whole year group. It’s proposed that the sixth form would be relocated to the first floor of the new building and that the ground floor and vacated space would be allocated to other departments. On Tuesday (November 13) Northamptonshire County Council’s cabinet approved allocating £123,000 of Section 106 funding to the three expansions. Other decisions that were approved included allocating £360,000 of Section 106 funding to the Stanton Cross Primary School project in Wellingborough and a new classroom costing £40,000 in Section 106 funding at Naseby Primary School. A decision on the Southfield expansion is expected to be made by Kettering Council by January 17 next year. How the expansions at Kettering Buccleuch Academy and Kettering Science Academy will look is not yet known. The trust behind Kettering Buccleuch Academy has been contacted for comment.